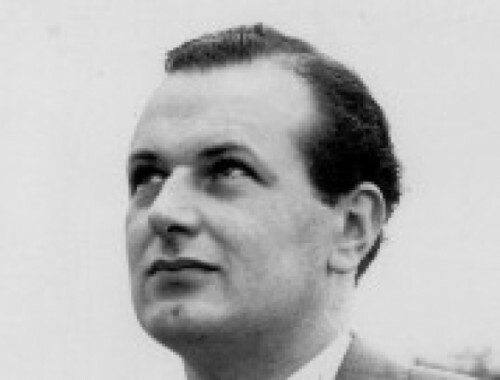 Bio Notes: Richard Rudolphe Chitham De’Ath was born in the small West Yorkshire town of Meltham on 24 October 1927. When he was about three years old, his family moved to Paisley, where his father worked as chief chemist at J&P Coats. He attended Paisley Academy, spent a short period at Almondbury boarding school in Yorkshire, and completed his schooling at Glasgow Academy. He acquired his architectural education through day classes at the Glasgow School of Architecture from 1944 to 1949, spending two months of the summers of 1945 and 1946 in the office of Thomas Smith Cordiner and the whole month of June 1947 on a study tour of Italy. Whilst at the GSA, he won several prizes, internal and external. Having graduated BArch from the University of Strathclyde, from June to September 1949 he attended the CIAM International Summer School in London. This was followed by national service with the Royal Engineers, and his excellence in his work there on bridge design led to him being invited to join the practice of Keppie, Henderson & Gleave in October 1951 as architectural assistant. He took a further study tour, this time to Spain, in September 1952, passed the professional practice exam the following month and was admitted ARIBA in January 1953, his proposers being Andrew Graham Henderson, William James Smith and T S Cordiner. He was elected ARIAS in 1958. De’Ath remained with the Keppie firm for the rest of his career, working principally on hospital and university projects. He was invited to become a junior partner in 1955 and was promoted to senior partner in 1960, by which time it had become Keppie, Henderson & Partners following Gleave’s departure in 1958. He was elected FRIBA on 5 June 1968, proposed by Jack Antonio Coia, Walter Underwood, and Ninian R J Johnston who praised his ‘solid capacity for detailed design’ and his buildings as ‘complex’ in nature and ‘very successful in their function as well as very satisfying visually’. He was known for his exceptionally fine draughtsmanship and meticulous approach; when working on the new Glasgow Sheriff Courthouse, he visited all the stone quarries that were providing material, to ensure a good match in quality and colour. He officially retired from architectural practice in 1987, but his passion for architecture endured, and he completed his last project – an environmentally friendly German ‘HufHaus’ in the grounds of his Helensburgh home – when nearly 80 years old, having been inspired by the television programme ‘Grand Designs’. His retirement allowed him time to devote to developing his skills as a painter: he travelled across Europe and regularly exhibited through the Scottish Society of Architect Artists. Among his other interests, he enjoyed motor racing, competing at Ingliston on his 78th birthday and treating himself to an Alfa Romeo Brera which he continued to drive until the month prior to his death. He had also been a keen competitive yachtsman, having learnt to sail during his time with the Royal Engineers: later based at the Royal Northern and Clyde Yacht Club at Rhu, he had begun on a Loch Long named ‘Barracuda’, moved on to a Dragon named ‘Meteor’, then progressed to larger boats. He died in Helensburgh on 28 November 2011. He was predeceased by his wife Marjorie but survived by his two daughters, Winnie and Anne. 1957 Southern General Hospital, Accident and Orthopaedic block Glasgow Scotland Entirely responsible. After 1960 Belvidere Hospital Glasgow Scotland Limb and appliance clinic - entirely responsible. After 1960 Stirling Royal Infirmary, Outpatients and Casualty Department Stirling Stirlingshire Scotland Entirely responsible. 1964 Govan Combination Poorhouse and Asylum Govan Glasgow Scotland Maternity Unit, new kitchen and staff dining rooms, new pharmacy building, rehabilitation centre and staff residential accommodation. As one of two/three partners in charge. 1967 Stirling Royal Infirmary, Maternity Unit Stirling Stirlingshire Scotland Partner in charge with Thomas Russell Scott. 1968 Gartnavel General Hospital Glasgow Scotland Partner in charge with Thomas Russell Scott. 1969 Airdrie District (Monklands) General Hospital Airdrie Lanarkshire Scotland Partner in charge with Thomas Russell Scott.